We know some parts of North America are still dealing with wintry weather, but now is the perfect time to think about spring cleaning your wardrobe to make sure you’re ready for summer…whenever it decides to arrive! 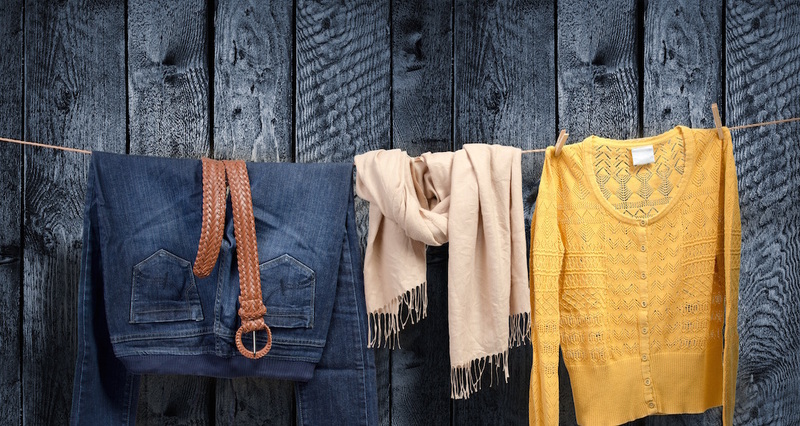 First and foremost, we recommend washing all of your winter woolens in either Eucalyptus or Lavender Eucalan before you pack them away for the season. Both of these scents contain essential oils which are naturally moth-repellent; our formula also contains lanolin will soften and condition even the most delicate fibres. Cleaning your your garments before storing not only prevents discoloration, it will also help to keep moths and other pests away since they are often attracted by body odors on garments. While many folks choose to forgo hosiery in the summer months, now is still a great time to check in on your stockings and knee-highs: be honest, when was the last time you washed them? We actually recommend cleaning hosiery in Eucalan after each use, so now is a great time to start this habit if you prefer to wear hosiery year-round. For those who have heavier-weight tights for winter or skip hosiery altogether when the temperature rises, we encourage you to give them a wash in either Lavender, Grapefruit or Jasmine Eucalan, all of which are naturally antiseptic. While we’re on the subject, slips and camisoles can also benefit from a hand wash session with Eucalan – again, these are delicate items which are probably not washed as frequently as the bras and other undergarments worn on a more frequent basis. If your workout routine went into hibernation over the winter months, now is the time to pull out your sports bras, yoga pants, and other high-tech workout gear. Hand washing these garments will keep them looking and performing like new, and since you already have some Eucalan lying around, there is no additional investment on your part! Last but not least, those lightweight linens, silk and cottons can probably use some freshening up after sitting in the back of your closet (or in storage) for the season. Many of these items are probably marked dry clean only; luckily you can safely and effectively clean these items with Eucalan, which will save you a trip to the dry cleaner and leave money in your pocket! For more spring cleaning ideas and tips using Eucalan, click here. This year, Earth Day is Wednesday, April 22, but we believe that every day is Earth Day when it comes to conserving, reusing, and recycling! Though there are many ways to raise awareness and make a difference – too many to fit into just one blog post! – we’d like to share four of our favourite simple ways to celebrate Earth Day, every day! Green your laundry routine. Run back-to-back loads in the dryer to take advantage of the fact that the dryer is already hot. Better yet, let your laundry line dry or lay flat to dry! For more eco-friendly laundry tips, click here. Create a habitat for struggling populations. You may have heard lots of stories in the news about the declining bee and Monarch Butterfly populations, but did you know that you could simply plant milkweed or wildflowers to do you part? Click here for more information on ways you can save the bees and here for more information about Monarch butterflies. Use cloth diapers for your newborn instead of disposable diapers. Besides the fact that over 90% of single-use diapers end up in landfill, they also require a significant amount of resources to manufacture: over 300 pounds of wood, 50 pounds of petroleum feedstocks and 20 pounds of chlorine are used to produce disposable diapers for one baby each year (source: RealDiapers.org). Recycle more than just paper, glass bottles, and aluminum cans. This blog post from the Design*Sponge archives has some fantastic resources for finding ways to recycle everyday items such as electronics, clothing, non-standard plastics and more which would otherwise end up in a landfill. We’d love to know what you do to reduce, reuse and recycle year-round, so leave your eco-friendly tips and tricks in the comments on this post!